Can you spot this same street corner in San Francisco? It is nearly a century that separates these two views of the same street. * The one at the top shows the city after a massive earthquake devastated it in 1906. * The one at the bottom shows the same city, from the same corner in 2003. 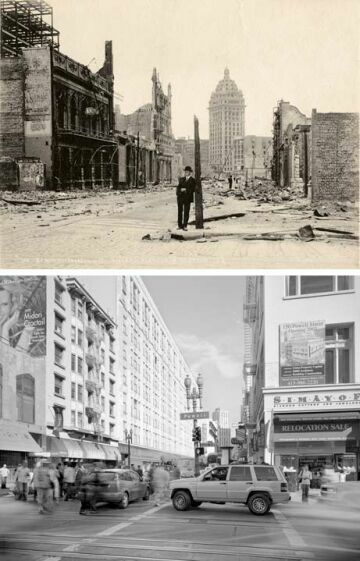 These images are taken from a new book and exhibit called After the Ruins, 1906 and 2006: Rephotographing the San Francisco Earthquake and Fire by Mark Klett, with Michael Lundgren.